The Old City of Shanghai, also formerly known as the Chinese city, is the traditional urban core of Shanghai, China. Its boundary was formerly defined by a defensive wall. 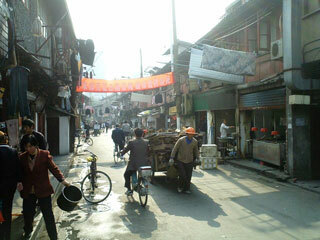 The Old City was the county seat for the old county of Shanghai. With the advent of foreign concessions in Shanghai, the Old City became just one part of Shanghai's urban core but continued for decades to be the seat of the Chinese authority in Shanghai. Notable features include the City God Temple which is located in the center of the Old City and is connected to the Yuyuan Garden. This article uses material from the Wikipedia article "Old City of Shanghai", which is released under the Creative Commons Attribution-Share-Alike 3.0 License.